Once again, Dorie did not disappoint. I made some alterations to the recipe so that my fresh plum breakfast cake turned out a little healthier than Dorie's and slightly more breakfasty than desserty but she gave me a great place to start. 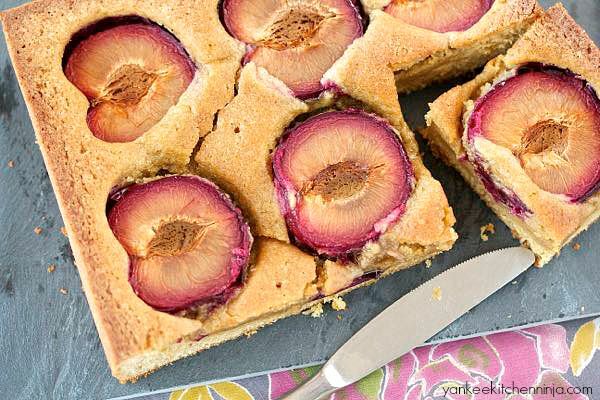 This fresh plum breakfast cake is definitely cakier than the recipe of my childhood but it's still got that amazing sweet-tart flavor that you can only get from fresh plums that have started to soften and break down from baking. 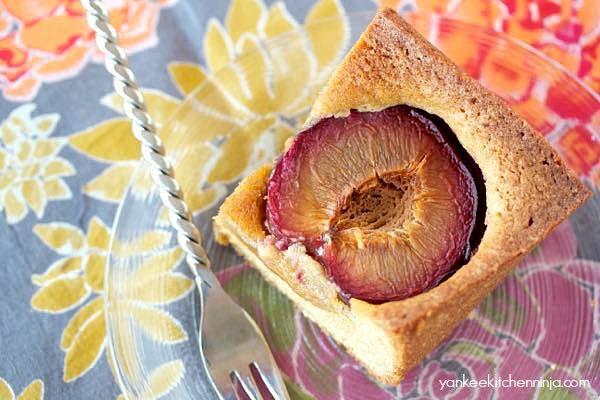 Not to mention that the larger size of the halved red plums delineate perfectly sized portions of the cake. And they look so beautiful -- like juicy little magenta hearts. 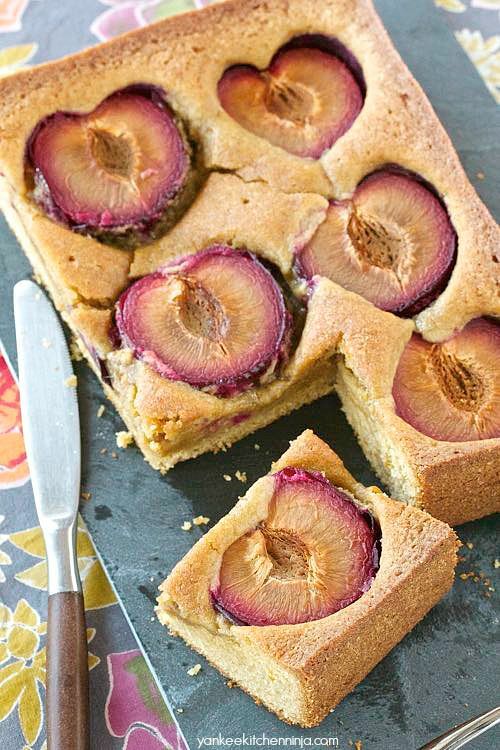 Have you been enjoying seasonally fresh plums? Do you eat them plain or bake with them? Leave a comment: The Ninj wants to know. In a small bowl, whisk together the flour, baking powder, salt and cardamom and set aside. Using a mixer, cream the butter and sugar until fluffy (about 5 minutes). Add the eggs and beat until well blended. Next, add the oil, vanilla and orange zest and continue to beat until very smooth. On low speed, add the dry mixture and beat until just incorporated. Pour the batter evenly into a prepared 8 x 8 baking pan. Nestle the plums, cut side up, into the batter in even rows (3 x 3 for medium plums, 4 x 4 for small ones). Bake for about 35-40 minutes or until the cake is nicely browned and a toothpick inserted into the center comes out clean. Remove from the oven and cool in the pan for about 10-15 minutes, then carefully remove the cake from the pan and cool completely on a wire rack. Ninj, that looks so good. I love plums, if they're ripe enough. Great job as usual ! Thanks, Jeff -- hope you enjoy it!